Football season is here and going strong, and like many fans we long for Sunday afternoon when the games begin. However, you don't have to wait until the weekend to get your football fix. Whether it's helpful advice you need for your fantasy football team, or if you just want to check scores while away from a TV or computer, we'll show you which apps to download. More than half of the ratings on this app are a full five stars, so that should tell you something about the quality of content you'll get in NFL Fantasy Cheat Sheet 2011. We could all use a little helpful advice with our fantasy football teams, and I know from experience that the projections on ESPN are often way off from what actually happens on the field. This app uses a variety of data and algorithms to calculate player values on a per-game basis. You'll know when to put in a backup player when a starter is out on injury, or when your favorite quarterback is up against the toughest defense in the league. 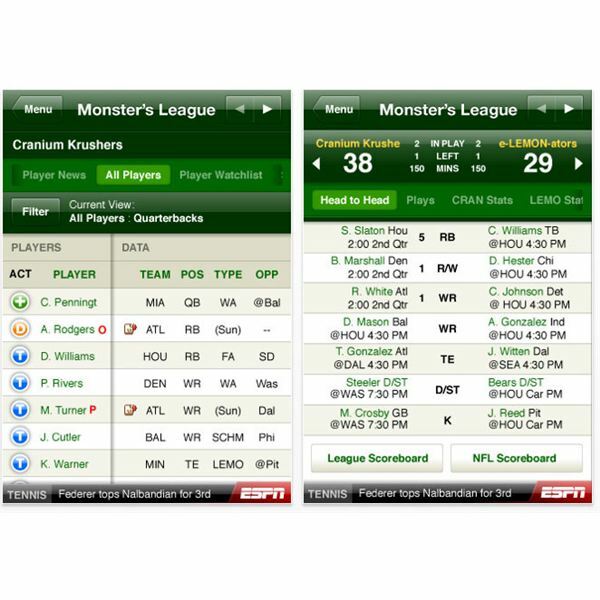 These types of decisions are what make or break your fantasy football team score. For $2.99, this app will give you that advantage. Just don't tell any of your league mates about it! 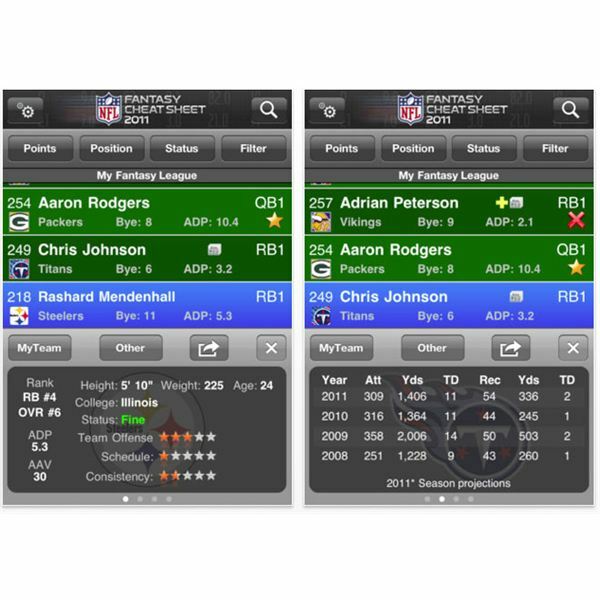 If you play fantasy football on ESPN.com, then you need to get the ESPN Fantasy Football 2011 app to keep track of your team. It allows you to do pretty much everything you can do on the main website, and that includes team management, tracking scores, and more. You can load up the app and swap players from the bench before a game starts, drop some players or add new ones, and even suggest trades with other teams. I like to use the app on game days to keep track of my player's individual scores, and it is all updated in real time. This is perfect for when you might need to make a last-minute change and don't always have a computer handy, plus it's totally free. Want to play some football on your iPhone or iPod Touch? If so, check out the Madden NFL 12 game app. Chances are you already have it on your home game console, so why not extend it to your Apple handheld device? It uses all the real teams playing in their actual stadiums with the real team members, so you can create your own matches and see if you can play better than the pros. This game features excellent graphics and animation, several different play modes, and a control system built just for the touch screen. With all those features, the $4.99 price tag is very reasonable, and it's updated regularly. Sometimes all those stats and information can be overwhelming when all you want to do is check the score, and that's where this NFL Scores app comes in. This completely free app is very simple in that it shows you what teams are playing and when, then on game day it shows you the score and nothing more. It's beautifully simple and tells you just what you need to know. This is perfect to quickly check all the scores, then put your phone away. If you get stuck with some work or family obligation that keeps you from watching the games and you know that you'll get in trouble with the boss or wife (same difference, right guys?) if you go hide away somewhere watching the game on your iPhone, then this app will give you the quick fix that you need. Want to listen to your favorite games no matter where you are? Instead of paying for satellite radio service, just pick up this 99 cent app and listen to whatever game you want. 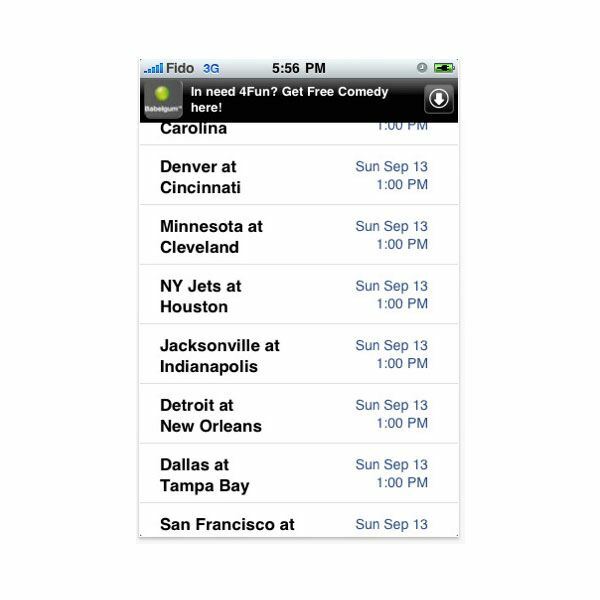 It shows all the team schedules, so just find the one you want and the app lets you tune right into the game. If you are a football fan who has to travel or maybe you live in a region where another team is more dominant, then you must get this app. It's a fairly new release, but user reviews are singing its praises. 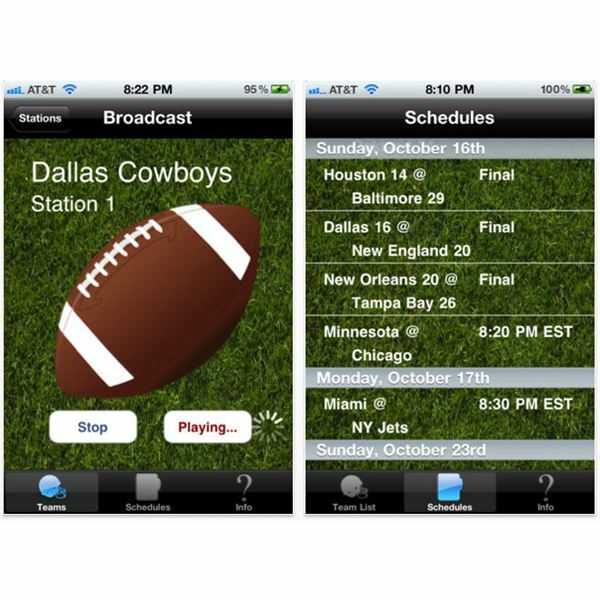 NFL '11 – This is the official app of the NFL, but many users complain about it showing too many ads while you use it. The app is free, though. WatchESPN – This is a great app if you qualify to actually use it. Access to the videos is based on your Internet service provider, so you may or may not be able to use this depending on your subscription. The app itself is free, so you can at least try it out. NFL Team Apps – Every NFL team has their own official app, and they are free to download. This is perfect for the fan who wants to keep track of everything going on with just one team. All iTunes screenshots taken and modified by the author.